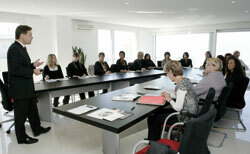 The main purpose of our seminars is to help you to run your own cosmetic institute with great success. Therefore, we offer you professional advisory services. Courses take place in our company’s own teaching facilities and focus on different fields which are directly related to your institute’s requirements. Dr. Baumann SkinIdent will cover the travel costs for the seminars up to 100%. Bionomy, i.e. skin friendliness coupled with animal and environmental friendliness, is our guiding principle. This seminar provides you an introduction of the basics of bionome quality standards in skin care and supports you with information of practical experiences with our products. Moreover, you will learn about the enormous potential of our products for treatments and sales and, secondly, you will be informed about the practical application of advertising aids. The seminar is hosted by cosmetic specialist Annette Smeenk. This seminar is intended to further the expert knowledge imparted in Basic Seminar I. It is crucial for working with our products, as it provides additional information of our quality standards in skin care. Hence, it is of great benefit for cosmeticians, their institutes and costumers. The seminars aims are, on the one hand, to review all the active ingredients, and, on the other hand, to enlarge the knowledge of bionome skin care and its great importance for a beautiful and healthy skin. The seminar is held by Dr. med. Ernst Walter Henrich und Dr. rer. nat. Thomas Baumann. Good nutrition is an essential element of a healthy lifestyle and plays a crucial role for beautiful and healthy skin, as well. In this seminar Dr. med. Ernst Walter Henrich presents recent nutritional studies of reputable universities and scientist, and explains their findings in a comprehensible manner. This seminar is essential for all cosmeticians who intend to provide their customers optimal information on this topic. Inter alia, the dermatological criteria for tolerable, healthy and effective beauty care are discussed. Dr. Henrich also explains the most important skin diseases that cosmeticians encounter in their daily work and introduces the right accompanying care. One central topic of this seminar is the study of the causes of skin ageing. In this context, the seminar introduces active ingredients and nutrients which have positive effects on the health of the skin. Additionally, various skin diseases and their reasons are studied in more detail. Here, particular attention is given to the role of the skin micro flora, and to genetic and hormonal aspects. It is quite simple to be successful and to earn money with a beauty salon. You only need to do what successful Dr. Baumann SkinIdent Cosmetic Institutes have done before. After the seminar you can put this knowledge into practice immediately. Consulting is the most important element to run your own institute with great success, as well as to establish and maintain a healthy relationship between you and your customers. In this seminar the consulting process is analyzed in detail and explained in a comprehensible manner. Additionally, practical exercises are performed to help you to improve your consulting skills. Alternative: The objective of the seminar is to provide the best available consulting to help you to advice your customers properly. Soon, you will recognize that the now well-informed customers purchase the products automatically. After this seminar, many of the participants experienced an enormous increase in the turnover. Our Make-up cosmetics meet the high standard demands of professional users. Simultaneously, it is also based on the bionome quality guidelines, i.e. the makeup line utilizes the very same valuable and healthy ingredients than the skin care lines. In this seminar, make-up artist Andreas Wussow (state-certified cosmetician) teaches the correct application of decorative cosmetics. After this seminar you will recognize the special quality of the Dr. Baumann MakeUP-Line and can use it to its full potential. The seminar followed on from the MakeUp-Basic-Seminar I. Its aim is to review existing applications in the field of decorative cosmetics and to provide answers to frequently asked questions. How is a professional photo make-up applied? What is important for an age-appropriate make-up? What is the optimal make-up for the evening and with which cosmetic refinements do the bride optimize her brilliant appearance? Solemn, dignified or simply beautiful – make-up artist and state-certified cosmetician Andreas Wussow shows all possibilities of the Dr. Baumann MakeUP-Line. Seminar on the application of the “Instituts-Manager"
The “Instituts-Manager" is a software package which allows you to organize your institute easily and efficiently. Therefore, the “Instituts-Manager" offers all important functions needed, viz. electronic index card, treatment plans, appointment planning, product purchasing, product sales, warehouse management and so many more. In this seminar you will learn about all the key functions and their use during numerous practical exercises. You are guided through the program step by step and, thus, also persons with limited computer knowledge become acquainted with the most important functions of the program at the end of the seminar. What treatments can I offer? What variations are possible? Which products do I need for which skin? How do I bring fresh impetus to my treatments? In this seminar we jointly answer these and further questions: From business treatment to luxury treatment, from the ideal treatment for cosmetics starters to the optimal care treatment for our more experienced customers. This new seminar addresses advanced participants and presents all relevant active substances in detail. On the basis of recent studies the relationship between cosmetic ingredients and endogenous substance is discussed. Furthermore, the seminar provides support in the selection of the most suitable care products and imparts our knowledge for optimum customer advice. In addition, current topics and trends are examined from a scientific point of view. In that sense, the participants are invited to submit their own proposals for topics. These proposals must be received at least 14 days before the beginning of the seminar.